Calving season has arrived, albeit slightly early. It's once again time for those sleepless nights, anxious waits, heartbreaking lows, but also the incredible reward of seeing the birth of a live calf. This year, it seems that the calving season is starting slowly... which is great! It means that we can ease ourselves back into the routine of checking cows every couple of hours and adjusting our brains to look for all of those signs that suggest a cow is calving. 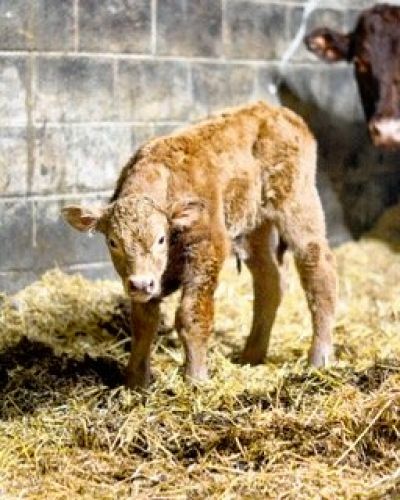 If you don't live on a farm, it can be difficult to understand why calving is such an important time. For Thomas and Keith, I think it would be fair to say it's probably the pinnacle of the year. It's what it's all about. For a cow, giving birth is quite probably the most difficult thing she ever has to do. In a worst case scenario, calving is the most likely point in which could culminate in the death of the cow or calf. As a result of this, I think most farmers spend more time with their cows than they do their families at this time of year! All of the cows are housed inside at this time of the year, as the ground is too wet outside and there is no grass growing for them to eat. Just the same as with humans; biosecurity is really important to a successful birth. Consequently, at this time of the year the sheds are mucked out more often, and cows are bedded up with even more straw. We usually have pens designated to only calving cows, so that the spread of infection during the calving process is minimised. A lot of time is spent cleaning and disinfecting pens between cows, so that the new baby calf gets the cleanest start to it's new life! Once the calf is born, it is vital that it feeds in the first two hours of life. The calf needs to be checked every few hours to ensure it has fed regularly. If it hasn't, Thomas or Keith will guide the calf to do so. This again, is a very time consuming process, with each feeding taking an average of twenty minutes. If the calf has fed, when it jumps up it should do a huge stretch; just like the brown and white calf is in the photo below. Once you see a calf doing this, you can pretty much rest assured that it's able to feed itself. As well as making sure the calf has fed, the navel cord is dipped in iodine to prevent any infection from the bedding. With around seventy five cows on farm this year, and roughly eighty percent of these due to calve in Spring, we are expecting around sixty calves to be born from February through to April. Hopefully, only a small handful of these will require Thomas's help. Thankfully, none of the four cows to calve so far have required assistance. Below, are the first two lovely calves of 2017! Mickleton Mill Caravan Park is a wonderfully peaceful and scenic family owned and managed caravan site and holiday park located in beautiful Lunedale and Teesdale and offering a range of Static Caravans, Touring Caravans or Self Catering Holiday Caravan Hire services. Whether looking for a static caravan pitch, a tourer pitch or a pitch for a seasonal tourer in Upper Teesdale, County Durham and the North Pennines AONB (Area of Outstanding Natural Beauty), then the magnificent setting, peace, tranquility, facilities and personal service in what was once the most northerly of the Yorkshire Dales, is absolutely tremendous and second to none. We are located near to the beautiful stone-built villages and towns of Mickleton, Middleton-in-Teesdale, Romaldkirk, Eggleston, Cotherstone, Lartington, Barnard Castle and Staindrop and as a centre for exploration, not far from the City of Durham with its famous World Heritage Site of castle and cathedral, Weardale, Swaledale and even the Lake District and the North Yorkshire Moors and Coast.